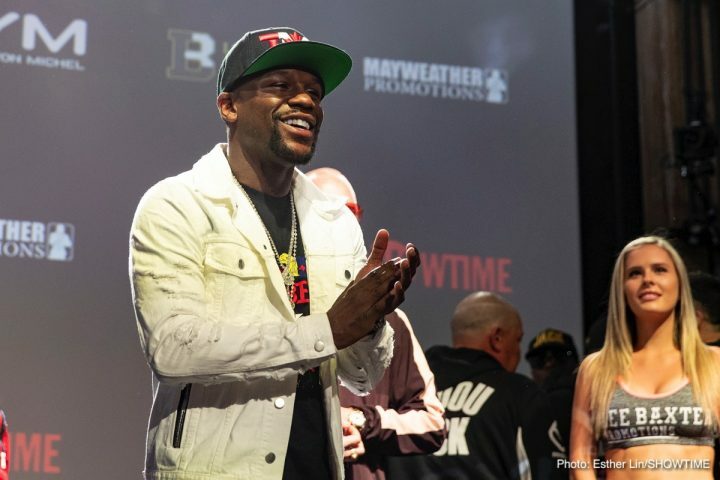 By Allan Fox: Floyd Mayweather Jr. will need to face UFC lightweight champion Khabib Nurmagomedov inside the octagon rather than a boxing ring, according to UFC president Dana White. He’s not on board with giving Khabib, 30, the green light to face the 41-year-old Mayweather in boxing event like we saw last year when two-division UFC champ Conor McGregor fought Floyd in August 2017 in Las Vegas and was stopped in the 10th round in a one-sided contest. McGregor’s MMA career has slowed to a crawl since then, with him fighting just once in losing to Khabib at UFC 229. You can argue that McGregor’s loss to Mayweather failed to help the UFC, as Conor hasn’t been fighting on a frequent basis and he doesn’t appear to be as motivated. If White is going to block Nurmagomedov from fighting Mayweather in a boxing event, then there’s no chance that the two of them will face each other. Even though Mayweather is interested in the nine-figure payday he’ get fighting Khabib, he’s not about to jump into the octagon with him to deal with the kicks, elbows and ground grappling. If the rules of combat in the octagon could be changed somewhat to give Mayweather a handicap, then it’s possible he might be agreeable to a fight against Khabib. However, there are too many things that would need to be eliminated for the fight to have a chance of happening. Khabib would still be too dangerous for Floyd even if the kicks were eliminated. It’s likely that Mayweather would want the kicks and grappling to be eliminated altogether before he’s agree to fight Nurmagomedov inside the octagon. On the assumpion that White and Khabib agree to just stand up fighting with no kicks, then they might as well let the fight take place inside a boxing ring, since Mayweather would totally dominate Khabib in a stand up right using just fists. It’s safe to say that Mayweather would knock Nurmagomedov out in the first 30 seconds of the fight if it were fought in a stand up position, and if it was his desire to finish the fight right away. It’s not likely White would agree to give Mayweather enough handicaps for him to agree to take the fight with Khabib in the octagon. Mayweather has also spoken of wanting to face McGregor in a rematch in boxing. Not surprisingly, McGregor is interested in a second fight against Mayweather inside the squared circle as well. With the big payday that McGregor got against Floyd last year, it’s a no-brainer that he wants to fight him inside the ring. Whether White can block McGregor from fighting Mayweather in another boxing fight is unclear. If so, then McGregor will need to stick to UFC. There are other MMA fighting organizations that Mayweather could checkout if he absolutely must fight one of those athletes in his novelty boxing matches. However, there aren’t a lot of big names in the other MMA organizations right now as there is in the UFC. The money that Mayweather could make fighting an obscure MMA fighter probably won’t be as good as it would if he were allowed to keep coming back to the UFC on an annual basis to beat their biggest stars in boxing matches. Mayweather can always look to other sports to try and set-up boxing matches. There’s golf, football, basketball and tennis. If picks out biggest stars from those sports for his boxing matches, he could keep his career going and he might be able to make some money. What’s unclear is if the Nevada State Athletic Commission will continue to sanction Mayweather’s fights as professional matches or not like they did with his fight against the novice McGregor last year. McGregor came into the Mayweather fight with a 0-0 record in boxing, and yet the Nevada Commission sanctioned the fight as a professional match. “My personal opinion is that it’s disrespectful of all the boxers because it becomes a farce, a pure circus. But from a business perspective it’s superb. As a sportsman, I don’t like that,” said two-time Olympic gold medalist Vasyl Lomachenko to LOMA Official TV via Michael Benton. What Lomachenko isn’t saying is it’s disrespectful to not only boxing but also the MMA for mismatches like Mayweather-McGregor and Mayweather-Khabib to take place. MMA fighters come off looking bad inside the boxing ring, and they don’t do well. On the flip side, Mayweather arguably makes boxing look bad because his fights look like circus events with him taking on a fighter with no background in the sport. Mayweather vs. McGregor was a high-priced mismatch last year. Mayweather thinks the fight was an exciting one, but the boxing and MMA fans disagree. It was boringly one-sided, and slow-paced from start to finish. It looked like Mayweather was carrying McGregor to give the fans something for their money. Even still, it was a boring to watch, and not the fight that many of the fans were hoping it would be. The magic question is will Mayweather agree to fight Khabib and other UFC stars inside the octagon? Does Mayweather need the money from those matches bad enough for him to risk injury fighting in a sport that he has no background in? White didn’t come out and say he wouldn’t allow Mayweather to fight Khabib inside the octagon, so you have to believe he’s all in for that kind of a fight. If Mayweather fought Khabib inside the boxing ring, he would need to go for a fast knockout to keep Khabib from grabbing him and putting him in a submission hold. If Mayweather had the hand speed he used to possess, you’d have to give him a fair chance of knocking Khabib out within seconds of the start of the fight. Someone like Saul Canelo Alvarez, Keith Thurman, Regis Prograis, Adonis Stevenson or Artur Beterbiev would have a chance of success in an MMA fight, but probably not Mayweather. He’s not a huge puncher, and he’s lost hand speed due to age and inactivity.